Roger Ebert: "Stanley Kubrick's 'Barry Lyndon,' received indifferently in 1975, has grown in stature in the years since and is now widely regarded as one of the master's best. It is certainly in every frame a Kubrick film: technically awesome, emotionally distant, remorseless in its doubt of human goodness." And just for fun, Leonard Rossiter's scenes as Captain Quin. Thank you to The Whelk for encouraging me to believe in myself and make this Fanfare post and for nudging me in the direction of The Kubrick Site. I love the casting of Ryan O'NeL in this cause I totally buy he's that dumb and blank. This is one of those movies where I that " ehhh three hour 17th century social mobility farce I'm not sure I'm into that tonight" thing until I sat down and watched it and got angry with my previous self for not getting to this sooner ITS LITERALLY EVERYTHING I LOVE IN A MOVIE. This may very well be the most gorgeously composed movie I've ever seen. I'm in awe of it. It's surprisingly funny, too. The narrator's dry observations are subtle enough that you might not realize how they're very casually upending the entire movie we think we're watching. As a reader of dense 18th century society novels I found it to be RACOUSLY HILARIOUS. I saw it for the first time a few weeks ago and it might be the best thing Kubrick did in terms of cinematography. The framing on the scene where Bullingdon goes to the club to demand satisfaction, with Barry slumped drunk on his chair is a masterpiece. I was actually working at the australian centre for the moving image when we had a Kubrick festival, and I was ushering during the Barry Lyndon parts, so I've actually seen this movie like, I dunno 8 or 9 times or more. Beautifully shot, and you should see the glass he shot it with - they look like 10 inch sculptures rather than lenses, wide as the sahara to soak up all the candlelight - the only light Kubrick used for those night scenes. Having watched it so many times, it is beautifully shot, and cold as all his films. Barry himself is almost impossible to like, and O'Neill's wide-eyed buffoonery is either really top notch acting, or really top notch casting. I do think (whilst acknowledging this is probably an artefact of having watched the film nine times), the movie need more. Visually it's a treat, but it's not exactly multi-layered and dripping with nuance. Without a real emotion centre to root for, it's a long journey, a kind of immaculately shot shaggy dog tale, for the viewer. An odd choice, textually, I think for Kubrick. I certainly didn't get the feel of Thackeray from it (it was Thackeray right?). This might be my second favorite Kubrick after the all-mighty 2001, I just want to live inside it. Watching it you start to forget that it wasn't actually filmed in the 18th century and not a recreation. The only problem I have with it is that it makes you sad that he was never able to finish his Napoleon film. I adore adore adore this movie, although I agree with smoke that it's not just Kubrick-cold but it's also hollow. However, the visuals and the MUSIC, Kubrick always uses such great MUSIC, make it a magnificent movie, perfectly decadent. I just DIE whenever the Handel Sarabande theme sounds. The lighting is spectacular and I read that Kubrick used only natural lighting except for candles for the night scenes. I never tire of this film. oh and the Schubert -- swoon. I accidentally happened across BL on TCM and was overjoyed. So much love for this film. Yeah, I had forgotten just how dry and tongue-in-cheek it was. It really could stand as a Kubrick comedy. 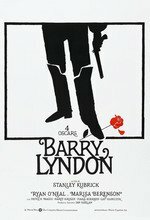 Barry Lyndon is a gorgeous piece of art, and I love it, but I was a teenager when it came out (didn't see it then) and when the Oscars came around and this costume period piece won for best song over Tommy, I kind of never forgave it, and carried that around for years before seeing it in all of its glory on a big screen. It really could stand as a Kubrick comedy. All of his films have a streak of dark humor running through them. 2001 has jokes all through it. O'Neill's wide-eyed buffoonery is either really top notch acting, or really top notch casting. Barry Lyndon is essentially Eyes Wide Shut as a period piece.